The wide angle of view makes the Tokina 11-20mm a useful lens for landscape, architecture, and interiors, as well as for shooting in restricted spaces. Wide-angle lenses can also create some dramatic pictures, as they exaggerate the distance from the near to the far, making subjects in the foreground appear very big. This is a popular technique in landscape photography, but can also be used to create striking images of other subjects in portrait or product photography. You need to get very close to the subject in the foreground to emphasize the effect, which has an impact on depth of field, so sharpness at the smaller apertures (such as f/11 to f/22) is important for photographers looking to capture maximum sharpness with a wide-angle lens. We’ve run the Canon EF-S lens mount version of the Tokina 11-20mm f/2.8 though our industry-standard optical tests and are delighted to bring you the verified results. 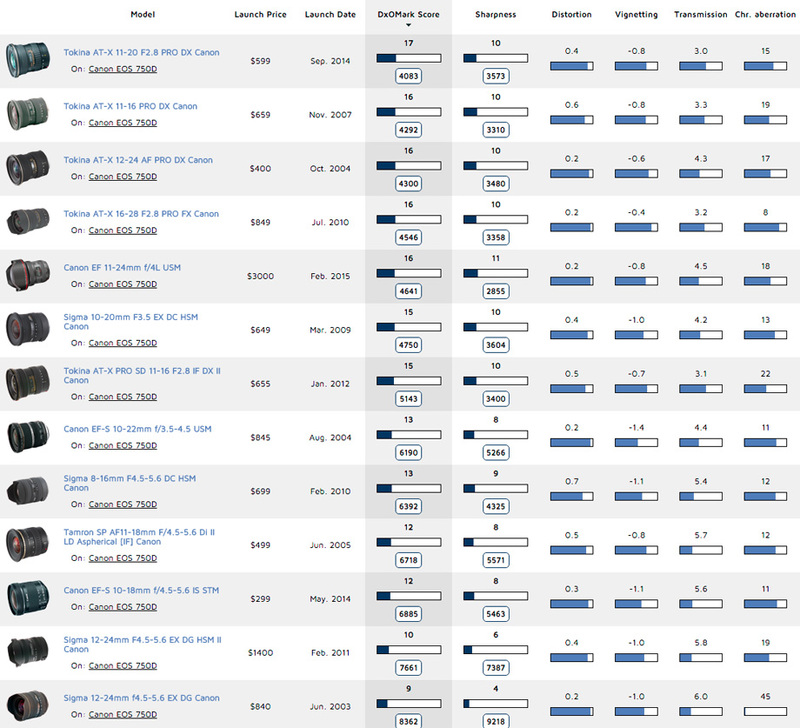 With an overall DxOMark score of 17 points, the Tokina 11-20mm f/2.8 is the highest-ranked wide-angle zoom for Canon EF-S. Scores range from that high of 17 points on the Canon 750D to a low of 10 points on the Canon 350D, and we’ve tested the Tokina 11-20mm f/2.8 on no fewer than 16 Canon APS-C-format DSLRs. Ranking just ahead of its predecessor, the Tokina 11-16mm f/2.8 with 16 points, the new 11-20mm boasts equal or better results in all lens metric categories. In fact, it narrowly outranks the pro-grade $3000 Canon EF 11-24mm f/4L USM, with better results for transmission and chromatic aberration compared to the L-series optic. For sharpness, the longer-focal-length Canon 11-24mm narrowly comes out on top with a score of 11 P-Mpix tested on the EOS 750D, compared to 10 P-Mpix for the new Tokina 11-20mm f/2.8, but there’s not great deal in it. 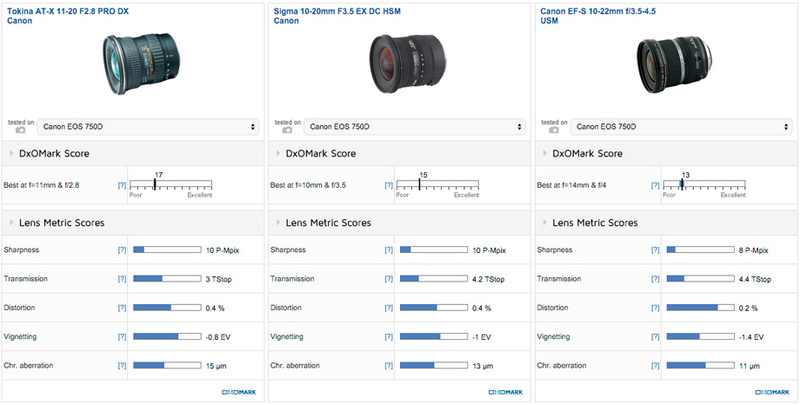 The sharpness P-Mpix map shows that the Tokina 11-20mm f/2.8 offers the strongest center resolution at all focal lengths using apertures between f/4 to f/8. At f/2.8, and between f/11 to f/22, center resolution is reduced, however, as indicated by the orange and red colors on its P-Mpix map. 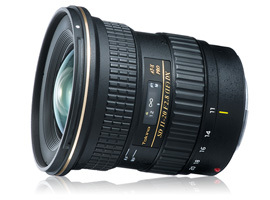 The EF-S version of the Tokina 11-20mm f/2.8 is sharpest in the middle of the focal range at 16mm, where it offers excellent center resolution at f/5.6, which extends almost to the corners of the frame. Close down one or two stops to f/8 and f/11, and although overall resolution isn’t quite as strong in the center, it is a little more uniform in the outer field at these settings. Rectilinear wide-angle lenses like the Tokina 11-20mm f/2.8 have the advantage of keeping lines reasonably straight, unlike a fisheye lens that significantly distorts lines in an image. Despite this, even rectilinear wides suffer from some barrel distortion, but the Tokina 11-20mm f/2.8 controls the effect well. At its widest 11mm focal length, barrel distortion of 1% will require some correction in post-processing, but zoom in to 20mm and the issue is almost completely eradicated, with distortion at just 0.1%. Another optical flaw associated with wide-angle zoom lenses is chromatic aberration, or fringing, which appears as colored lines along contrast edges. Achieving an overall chromatic aberration score of 15um, the Canon EF-S version of the Tokina 11-20mm f/2.8 handles fringing better than its Nikon equivalent, but some minor fringing does occur at the wider focal lengths. As indicated by the yellow/orange area on the chromatic aberration global map below, the problem is restricted mainly to between 11-13mm when using the widest f/2.8 and f/4 apertures, but from 16mm onwards, it isn’t an issue regardless of aperture setting. We’ve tested a total of 13 different wide-angle zoom lenses on the EOS 750D, with scores ranging from a high of 17 points for the new Tokina 11-20mm f/2.8 to a low of 9 points for the Sigma 12-24mm f/4.5-5.6 EX DG. Out of the two Canon own-brand options, the $649 EF-S 10-22mm f/3.5-4.5 USM outscores the newer $299 EF-S 10-18mm f/4.5-5.6 IS STM. In terms of features, despite a less robust build, the cheaper Canon 10-18mm option has the advantage of built-in stabilization (IS) and Canon’s latest stepping motor (STM) for video, but slower maximum apertures. The alternative third-party $449 Sigma 10-20mm f/3.5 EX DC features a fixed f/3.5 aperture, as well as a good build, but neither the Canon nor the Sigma score as well as the Tokina 11-20mm f/2.8’s 17 points in our tests, with overall scores of 15 points for the Sigma and 13 points for the Canon. Boasting the largest maximum aperture of the three, the Tokina 11-20mm f/2.8 offers the best transmission score of 3 TStop, as well as better vignetting at 0.8EV. The Canon 10-22mm offers the least distortion overall, with a score of just –0.2%, and both the Sigma and Canon options boast zero distortion at a wider 16mm focal length compared to the Tokina 11-20mm f/2.8’s best distortion result of –0.1% at 20mm. Sharpness between the two third-party Sigma and Tokina options is pretty close overall, and while none of these APS-C format wide-angle zooms offer excellent center sharpness at the minimum f/22 aperture, the Tokina and Sigma options boast better center resolution using wider apertures up to f/11 at more focal lengths, compared to the Canon 10-22mm f/3.5-4.5. A useful lens in restricted space that’s also capable of creating some dramatic images, a wide-angle lens is a great addition to any photographers’ kit bag and a “must have” for landscape and architectural photo enthusiasts. The new Tokina 11-20mm f/2.8’s increase in focal length over its 11-16mm predecessor makes it a more versatile option that puts it more in line with the wide-angle competition from Canon and Sigma. Tested on the EOS 750D, it’s also the highest-ranking EF-S-format wide-angle we’ve tested to date, with good transmission and well-controlled distortion and vignetting. It matches the resolution of Sigma’s 10-20mm overall for sharpness, and offers excellent center resolution at focal lengths using the wider apertures up to f/11. Resolution at 16mm using an f/8 aperture is the Tokina 11-20mm f/2.8’s sweet spot — boasting nearly uniform sharpness results for landscape shots — but for maximum depth-of-field shots, resolution at the minimum f/22 aperture resolution is just a little softer.